WHAT’S IN A NAME? – Alternate Comms. A man in an incredible hurry – Macedonia PM Zaev pushing through name change of Macedonia and steam rolling all opposition, including by-passing President Ivanov, to satisfy Greek demands. After a farcical vote on 11 January that passed by a razor-thin margin in Parliament after days of haggling, the SDSM-led government of Zoran Zaev announced that it has renamed the Republic of Macedonia as ‘North Macedonia’ (or ‘Severna Makedonija’ in the Macedonian language version), thereby fulfilling his part of the deal with the Greeks in the so-called Prespa Agreement of last spring. The voting was marred by allegations of fraud, bribery, threats and US strong-arming (US Embassy officials were even said to be physically within the parliament during the tumultuous day on unconfirmed social media reports). Although the opposition VMRO-DPMNE of Hristijan Mickoski immediately cried foul, the party has done suspiciously little in recent months to slow the pace of the Zaev train. For instance, the party only joined the call for a boycott of the 30 September referendum at the last moment, when it became clearer that a grassroots initiative to boycott would succeed- and that the supposed nationalist opposition party thus risked being upstaged. Similarly, in the Parliamentary deliberations in the days before the fatal vote, VMRO-DPMNE also did not join protesters who had been making their presence felt in wintry conditions. When Mickoski did finally show up, he used the impromptu platform more as an opportunity for party campaigning than for announcing any realistic plan to stop the Zaev Express. All in all, it looks like just more bark and no bite from the party- which had also called for early parliamentary elections to be held with this spring’s scheduled presidential elections. The fact that VMRO-DPMNE did little to stop the name change, but now claims to be indignant while party luminaries look to increase their influence in Washington, may well prove in future to justify past suspicions in the Macedonian public: that is, that VMRO-DPMNE privately agreed to US demands for renaming the country, in exchange for coming to power in the next elections. In this case, current government officials like Defense Minister Radmila Sekerinska and Foreign Minister Nikola Dimitrov will be handsomely ‘taken care of’ by their American handlers, with cushy jobs in NATO, the UN or similar well-paying organizations- while the average Macedonia is left to suffer the consequences of their reckless decisions and disdain for the popular will. “Immediately after,” the media reported, “Haradinaj posted on Twitter that he met with the Prime Minister of the Republic of Northern Macedonia. 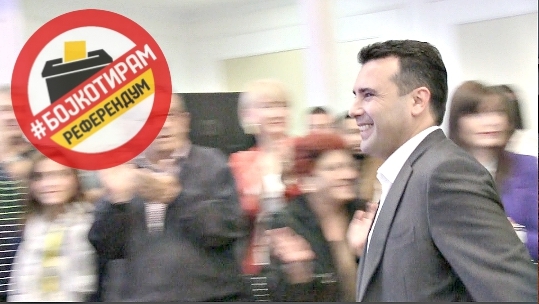 The Government of Macedonia reported that Zaev went on winter vacation in Germany and that his meeting with Haradinaj was a private meeting.” It should be remembered that the Kosovar prime minister is considered a close partner of Zaev, and was indeed mentioned specifically by ethnic Albanian politician Menduh Thaci, who stated during the political crisis that Zaev had sent him a text message stating that they should meet, because foreign powers were planning to overthrow the Gruevski government- with the help of Haradinaj and Sali Berisha in Albania. ANOTHER REFERENDUM ON THE HORIZON? As is well known the ‘North Macedonia’ name failed at the 30 September referendum, when only 34 to 39 percent of voters turned out. Those who did were widely regarded as being forced to vote by their parties (SDSM and its allies), as well as ethnic Albanians and others with little to no sentiment for the Macedonian cause. Two things remain puzzling about Mr. Petrov’s intervention. One, considering that the Zaev government steamrollered the official referendum, basically disregarding the low turnout and illegally pushing through the ‘solution’ of ‘North Macedonia,’ it stands to reason that no new referendum would fare better. Considering that the West and especially US-UK-EU axis have been stubbornly opposed to Macedonia keeping its constitutional name, some pundits are speculating that the WMC’s call for a new referendum is simply smoke and mirrors designed to help VMRO-DPMNE’s next political campaign, but not actually affect facts on the ground. Regardless of Petrov’s motives, in fairness, it does have to be said that the World Macedonian Congress was the group that successfully initiated the 2004 referendum- which also failed. That pivotal vote was against redrawing and reducing Macedonia’s municipalities (from 120 to 80) and their borders. Ironically enough, the very same SDSM party that urged people to do their democratic duty and vote in the 2018 referendum on name change had urged the population to boycott the 2004 referendum- the hypocrisy stinks to high heaven, but it merely reflects the cynicism of politics in Macedonia. A STATEMENT FROM THE RUSSIANS- INTERFERENCE OR DIPLOMATIC OVERTURES? From this show of stubborn determination in what were practically joint statements, it seems clear that claims of ‘Russian interference’ in Macedonia (as well as Greece) are exaggerated if not completely far-fetched. It’s not coincidental that the controversial American Ambassador, Jess Baily, is going to be replaced soon by a female diplomat coming straight from a posting at the US Embassy in Athens. It seems very clear that the US is calling the shots- in both Athens and Skopje. But what is most striking in the difference between the two approaches, beside the Russian appeal to international law (usually a favorite talking point of the West), was Moscow’s appeal to find a name compromise supported by the majority of both Greeks and Macedonians, and the latter states’ insistence that a political deal is good enough. The Greek response clearly gives the game away, stating that the agreement was reached between the two governments. This is a tacit admission of the fact that the 30 September referendum was a complete failure and illegal process. Ironically, the concept of an ‘agreement between two governments’ as legally binding and morally legitimate was made in heated comments for TEAM UZUNOV by the outgoing US Ambassador, in an odd exchange last fall in which Mr. Baily tried to defend the Prespa Agreement which foresaw the ‘North Macedonia’ solution by stating that it had been agreed between the two governments- not, in other words, by the people, who remain adamantly opposed. That conversation occurred in the context of a question by TEAM UZUNOV which simply asked Mr. Baily whether American academic Amanda Sloat- a former diplomat in the Obama era who is now a think-tank ‘expert’- was involved with writing the Prespa Agreement. Baily blew up at the question, as can be seen on this video. The question remains unanswered to this day, as Ms. Sloat herself has refused to respond to TEAM UZUNOV’s request. Macedonia’s President George Ivanov has been a staunch opponent of the Prespa Agreement, refusing to sign it into law. Likewise, the new language bill which will elevate Albanian as the second official language of Macedonia. The Plan has been hatched in a series of secret meetings between Greek and American officials, culminating in a June 2008 conference held in Washington, involving [US Secretary of State] Rice and Dora Bakoyannis, Greek’s feisty Foreign Minister. The Macedonian government was kept out of the loop and may still be unaware of the existence of the Plan, let alone its contents. It seems that the Greeks succeeded to convince the Americans that Macedonia is the intransigent party, piling one obstacle after another, in an attempt to avoid a politically unpopular settlement. Lately, the tiny polity’s young Prime Minister, Nikola Gruevski, sought to enlarge the scope of the protracted negotiations to include other bilateral issues, such as the restoration of property to Macedonians expelled from Greece decades ago and the recognition of the Macedonian Orthodox Church by its Greek counterpart. 1. The Republic of Macedonia will change its constitutional name (probably to Northern Macedonia, although that has not been decided yet). If true, this provision will constitute a major setback for Macedonia. No Macedonian government – let alone the current one – is likely to accept it. 2. Macedonia will be granted a transition period (of up to 10 years, according to some sources) – the time it would need to amend its constitution and to alter its registered name with various international and multilateral institutions. Greek Neo-Nazi political party Golden Dawn is largely condemned by the mainstream Western media for being extremist. Not so with the Albanian DUI, which has been given a “makeover” by the US and EU. Greece has to ratify the Prespa Agreement in its Parliament for it to come into effect. Once this is done, Greece removes its veto of Macedonia joining NATO and the EU. A lot of horse trading, pressure, threats have been applied by the West upon the Greek government of Prime Minister Tsipras to get it – the Prespa Agreement – through Parliament. Greek extremists oppose the name deal. This has confused the mainstream Western media into lumping Macedonian opponents in with Greek nationalist opponents as being one of the same. 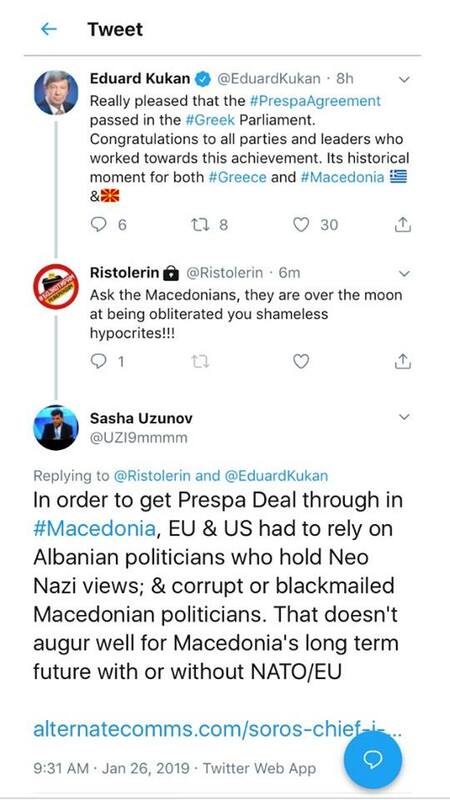 The point here is Greek extremists simply oppose any kind of deal or plan even if it is advantageous to them simply because of a burning hatred of anything Macedonian. 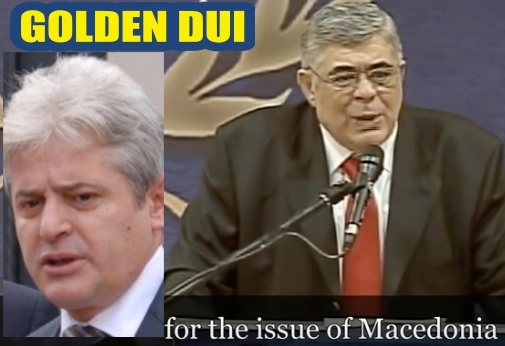 There is no Macedonian Neo-Nazi equivalent of Greek Golden Dawn in Macedonia, other than the Albanian DUI. Golden Dawn’s ideology in part is driven by a hatred of Macedonians, Turks, Jews, and even Albanians. 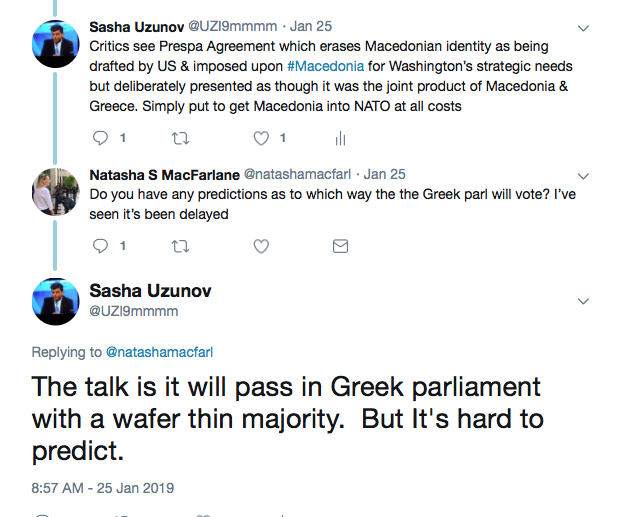 Greek Parliament vote to ratify the Prespa Agreement – Australian journalist Natasha MacFarlane asked me for my prediction. I wasn’t way too off the mark. (please note this is Australian eastern standard summer time). Supporters of name change of Macedonia, including EU mandarin Eduard Kukan, amongst a host of others, were quick to crow about the Greek Parliament passing the Prespa Agreement. We reminded Mr Kukan about the sleazy and nasty way the Prespa Agreement was approved in Parliament of Macedonia. If the EU and US have to rely on Albanian politicians who hold Neo-Nazi views (ie venerate WW2 Nazi collaborators) and Macedonian politicians who are corrupt and were blackmailed into voting for the Prespa Agreement, then Macedonia doesn’t have much of a future whether it joins NATO/EU or stays out. QUICK FIX? No long term plan for success? If a sizeable number of people still regard WW2 Albanian Nazi collaborators as “heroes” who took part in brutal ethnic cleansing on behalf of Adolf Hitler, murdering Macedonians and Albanians as well- and this is 2019 bearly 80 years since the end of WW2 – including the younger generation of Albanians that trend doesn’t suggest ethnic peaceful co-existence or harmony in Macedonia. That the EU and US knowingly support a politician such as Ali Ahmeti who holds Albanian Neo-Nazi views only confirms that there is no long term interest on the part of the EU and US in a Macedonian state of any kind. This is a quick “fix” for the US in order to cynically keep the Russians out and get Macedonia into NATO – nothing more. It is not a long term plan for “success” – and deliberately so. The Prespa Agreement forces Macedonia to give up its sovereignty to Greece – that is anything deemed “offensive” or in breach of the Agreement, and you can bet your bottom dollar it will be enforced by the Greek side, will be banned. Any official reference to Ancient Macedonian history, symbols etc. In effect, Macedonia has been forced to accept a Greek racist theory about the origins of the Macedonians as being “Slav” interlopers who arrived in the Balkans over 1,500 years ago from what is now present-day Ukraine/Russia even though mainstream experts such as Dr Florin Curta question the validity of the Slav Migration Theory. A “joint commission” will be set up to tackle what history books Macedonian school students can read etc. It’s a George Orwell 1984 scenario.